White paper on crime 2004 Part4/Chapter2/Section4/1. A juvenile training school is an institution that receives juveniles who are committed to it by family courts under a protective measure as well as juvenile prisoners who undergo the execution of their sentences at juvenile training schools under the provisions of the Juvenile Law in order to give them correctional education.As of April1,2004,there are52juvenile training schools and one branch school nationwide. A juvenile who is committed to a juvenile training school under a protective measure may be detained until he or she becomes20years old in principle.However,if he or she reaches20years of age within one year of his or her commitment to the school,the detention may be extended for up to one year from the adjudication of commitment. During the detention period at a juvenile training school,if an inmate has a serious physical or mental disorder or still has a strong criminal tendency,a family court may order the inmate to stay there up to the age of23as long as it is considered inappropriate to discharge him or her.When an inmate turns23years old and has a serious mental disorder,a family court may order the inmate to stay at a medical juvenile training school up to26years of age as long as it is considered inappropriate from the viewpoint of public welfare to discharge him or her. (4) Medical juvenile training schools(for juveniles aged14or over but under26with a serious physical or mental disorder). This program is provided to those juveniles who are expected to be corrected and rehabilitated through short-term continuous and intensive training as the relatively simple and easily treatable nature of their problems to be improved. This program is provided to those juveniles who are less inclined to delinquency than those who are subject to the general short-term program and are suitable for open treatment. 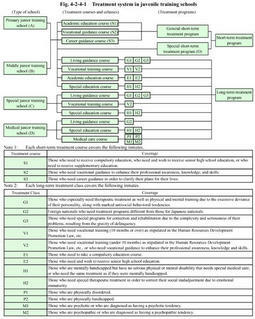 A long-term program is provided for those who are not suitable for short-term program.The term of detention for the long-term program is two years at most in principle.However,it may be individually determined if it is considered necessary to provide treatment for more than two years.The detention term of each inmate is set in a flexible manner in order to offer correctional education tailored and to ensure individual smooth rehabilitation.The detention term for general short-term and long-term programs may be extended within the limits stipulated in the Juvenile Training School Law. General short-term and long-term programs offer different treatment courses to meet the diverse educational needs of juveniles.There are three treatment courses in general short-term program,and five treatment courses in the long-term program. Fig. 4-2-4-1 illustrates the treatment system in juvenile training schools. A family court decides through a hearing the type of school to which a juvenile is committed.In the hearing,the family court may recommend the short-term program for the juvenile in question. After a decision is made to commit a juvenile to a juvenile training school,a juvenile classification home chooses a school to which the juvenile is to be sent in line with the family court recommendation of the type of treatment,if any,while taking into consideration which courses are available in each juvenile training school and what kind of treatment the juvenile needs. If the superintendent of a juvenile training school considers that the goal of correctional education for a juvenile has been attained,he/she may file an application for early discharge of the juvenile with the relevant Regional Parole Board.He/she may also file an application for parole with the Parole Board,if he/she considers parole to be appropriate in consideration of the fact that the juvenile has improved to the highest level of treatment program.